We are delighted to offer this extremely spacious family home located in a favoured residential road within walking distance of Sanderstead Station and the hugely popular 'Ridgeway' Primary School. The property provides versatile accommodation to include 4 Reception rooms, modern fitted kitchen with integrated appliances, ground floor cloakroom, an impressive entrance hall with turning staircase to first floor, and single garage. 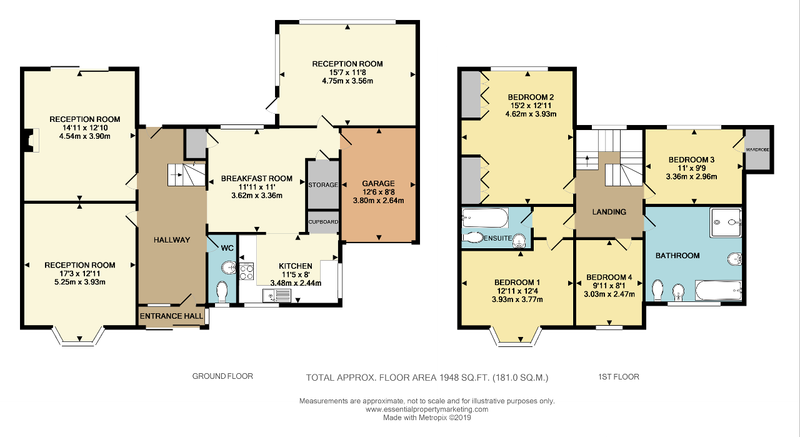 To the first floor are 4 good sized bedrooms, the master enjoying an en-suite bathroom and the remaining 3 all being light and airy and all approached off the large landing area. The family bathroom has a 4 piece suite including a separate shower. Windows and exterior doors are double glazed throughout the property. Externally the property boasts fantastic gardens, the rear being approx 170' in length with a sunny southerly aspect, mainly laid to lawn with a great sized patio area and a fabulous heated Pool to the rear creating a delightful entertaining area which can easily be fenced off for safety and security if so desired. The gardens are secluded by fencing and mature hedging, shrubs and flower borders all well maintained along with a wildlife pond. To the front is a wide paved driveway providing Off street parking for several cars and gated access to the rear. Essenden Road is located off the desirable West Hill and adjoins Mayfield Road which provides access to the nearby Sanderstead Train Station, being under a 10 minute walk from the property whilst other stations include Purley Oaks, South Croydon and East Croydon.There are further amenities on offer in the local and surrounding area including the frequent 403 and 412 bus services linking Sanderstead Village, Selsdon,Warlingham and Croydon, Croham Hurst Woods, state and private educational establishments including the highly renowned schools of Whitgift, Croydon High, Royal Russell and Trinity along with Ridgeway, Gresham and Atwood primary schools, Purley Downs and Croham Hurst golf clubs, Sanderstead Cricket Club and several local tennis clubs along with comprehensive shopping facilities at Croydon and Bromley. The M25 junction 6 is located at Godstone and offers access to Gatwick and the south Coast. Approached via sliding double glazed doors enclosing the entrance porch and oak door leading to the impressively spacious hallway with a turning staircase to first floor. There is an area suitable for coats and casement door providing access to the rear garden. Over the stairs is a large picture window providing a beautiful view over the rear garden and beyond. A delightfully light and sunny room due to the Southerly aspect with sliding patio doors opening to the lovely Rear Garden, gas flame effect fire. The turning staircase leads to the spacious first floor landing with doors leading to all rooms. Overlooking the front gardens the master bedroom offers great space with a small inner hallway and additional door to En- Suite Bathroom comprising modern white suite. An exceptionally large double room with delightful southerly rear aspect and fitted wardrobes to one wall. A huge room with 4 piece white suite including a separate shower, double glazed window. The beautifully maintained Rear Gardens are a particular feature of this property, extending to approximately 170' being mainly laid to lawn with the upper section enjoying a superb SWIMMING POOL approached via curved steps. There is a separate outbuilding housing the pump, heating and filtration system. The pool has been meticulously maintained and offers a great family and entertaining space whilst enjoying delightful views over Croham Hurst and beyond. The pool comes with roll away cover and this area is easily sectioned off and can be fenced if so desired. The Garden also boasts a good sized patio and as a whole enjoys much privacy with mature hedge, shrub and plant borders, wildlife pond, 2 timber sheds. An integral Single Garage with up and over door opening to Large Paved Driveway providing parking for numerous vehicles.